Jen Winter has been an avid amateur astronomer and professional astro-photographer since the late 1990's. Serious solar astronomers, Jen and her late husband, Vic bought the Solar Filter manufacturing company, DayStar Filters in 2006. DayStar Filters are hydrogen alpha solar filters used by amateurs and professional observatories around the world for observing the Sun in various wavelengths. Jen still owns and operates that manufacturing business today. She also owns ICSTARS, a family of astronomy companies all incorporated to promote the knowledge and appreciation for astronomy around the world. 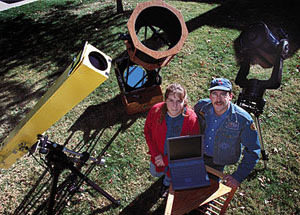 Vic and Jen founded the not-for-profit StarGarden Foundation in 1999, released their first book of Astrophotography, "Our Spacious Skies" in 2001, and became JPL-NASA Solar System ambassadors in 2002. Jen owns and operates the Charles Douglas Public observatory at the ICSTARS Ranch in Warrensburg, MO and gives regular talks on astronomy and photography in the area. Since leading her first eclipse expedition to Madagascar in 2001, Jen has placed over 1000 clients and many thousands more in staff and locals safely into the path. Her record of clients to reach the path of totality is perfect, with weather success ratio of all eclipse expeditions currently running 15:2. She organized the only group to witness the eclipse from land in Antarctica in 2003 and has chartered 2 ships for the purpose of intercepting the eclipse path at sea. Other succesful expeditions have included: Meteor storms, annular eclipses, transit of venus, solstice ceremony, star parties and meteorite expeditions. If you would prefer more support and explanation, they will gladly explain and assist you in understanding what you have traveled to see. As a JPL/NASA solar solar system ambassador, Jen is happy to spend the time to make things clear. Astronomical Tours has been leading astronomical expeditions since 1998 as a special-interest affinity travel company. We are an IATAN, TRUE and CLIA affiliated travel agency and holds two million dollars in insurance coverage. Each expedition planned is explored fully before we present it to you. We calculate the astronomical circumstances, visit the site if necessary and check the baggage restrictions so you know what to expect. Our tours are accompanied by highly qualified astronomers and agents (often ourselves) to insure everything goes as planned. Through thick and thin, the Winters at Astronomical Tours have put clients first; putting client safety, and the eclipse ahead of their own pockets. "Every client gets into the path no matter what." And through the years, the owners accomplished that goal to a 100% standard. Everywhere Astronomical Tours goes, Jen will be overseeing charitable donations of astronomical, science and educational supplies. Sometimes the donation is a small, collection of pencils or CDs for a school. Other times, when the whole group joins forces, we can amass hundreds of pounds of school supplies. 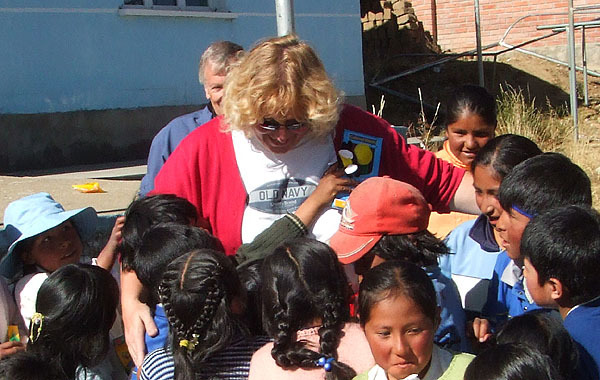 In Bolivia in 2004, our small group raised funds to re-roof the high school. In 2006, our group brought safe solar eclipse viewers to 10,000 residents in the impoverished country of Niger. In Bolivia, we take matters personally. For over a decade, we have made more than 20 collective visits to the Andean Altiplano made countless friends and adopted the schools. Our kinship for the country, the skies and the people of Bolivia brings us back year after year to our friends in the South.